A London Symphony, where characterful detail is worked into the scheme. A first opera, Hugh the Drover, made direct use of folksongs, which Vaughan Williams normally did not do in his orchestral works. His study of folksong, however, certainly facilitated the pastoral tone of The Lark Ascending, for violin and orchestra, and then of the Pastoral Symphony. At the beginning of the 1920s there followed a group of religious works continuing the visionary manner: the unaccompanied Mass in g Minor, the Revelation oratorio Sancta civitas and the 'pastoral episode' The Shepherds of the Delectable Mountains, later incorporated in The Pilgrim's Progress. But if the glowing serenity of pastoral and vision were to remain central during the decades of work on that magnum opus, works of the later 1920s show a widening of scope, towards the comedy of the operas Sir John in Love (after The Merry Wives of Windsor) and The Poisoned Kiss, and towards the angularity of Satan's music in Job and of the Fourth Symphony. The quite different Fifth Symphony has more connection with The Pilgrim's Progress, and was the central work of a period that also included the cantata Dona nobis pacem, the opulent Serenade to Music for 16 singers and orchestra, and the a Minor string quartet, the finest of Vaughan Williams's rather few chamber works. A final period opened with the desolate, pessimistic Sixth Symphony, after which Vaughan Williams found a focus in the natural world for such bleakness when he was asked to write the music for the film Scott of the Antarctic: out of that world came his Seventh Symphony, the Sinfonia Antarctica, whose pitched percussion coloring he used more ebulliently in the Eighth Symphony, the Ninth returning to the contemplative world of The Pilgrim's Progress. 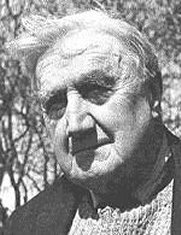 Vaughan Williams died in London on 26 August 1958. RVW pictured in 1942 with Foxy.